360° and 180° adjustable stream drippers, available with 1/4" barb or 10-32 threads, are designed, based on model, to produce a gentle stream with adjustable flow rated from 0 to 19 GPH and a diameter range from 0" to 42” at 30 PSI. Each 360° and 180° adjustable stream dripper has an adjustable cap that allows for simultaneous control of the flow rate and the wetting area. 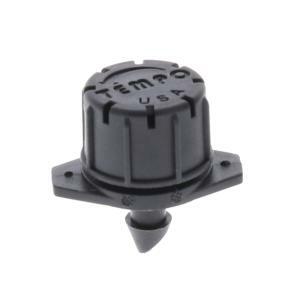 These drippers are very useful in residential gardens for an individual plant or group of plants, inside planter boxes and small to large pots, or for ground covers, shrubs, and trees. These adjustable stream drippers offer a convenient way to water areas where conventional sprinkler systems are not suitable. 2 4.0 GPH 0" 5.5 GPH 6" 6.0 GPH 8"
4 6.5 GPH 7" 8.0 GPH 10" 10.0 GPH 16"
6 7.5 GPH 10" 9.0 GPH 13" 11.0 GPH 18"
8 8.5 GPH 12" 10.0 GPH 16" 12.0 GPH 13"
10 9.0 GPH 14" 11.0 GPH 18" 13.0 GPH 22"
12 9.5 GPH 15" 12.0 GPH 20" 14.0 GPH 24"
14 10.0 GPH 16" 12.5 GPH 22" 15.0 GPH 26"
2 5.0 GPH 8" 6.5 GPH 11" 7.5 GPH 14"
4 7.5 GPH 15" 10.0 GPH 19" 12.0 GPH 24"
6 9.0 GPH 20" 12.0 GPH 25" 14.0 GPH 31"
8 10.0 GPH 24" 13.0 GPH 29" 15.5 GPH 35"
10 11.0 GPH 27" 14.0 GPH 32" 17.0 GPH 38"
12 12.0 GPH 28" 15.0 GPH 34" 18.0 GPH 40"
14 13.0 GPH 29" 16.0 GPH 35" 19.0 GPH 42"